Dr. Smith's ECG Blog: Two cases of ST Elevation with Terminal T-wave Inversion - do either, neither, or both need reperfusion? Two cases of ST Elevation with Terminal T-wave Inversion - do either, neither, or both need reperfusion? Do either or both of these ECGs show ischemic changes? If so, what should you do and why? I responded: "Awesome classic benign T wave inversion! That's the patient's baseline normal variant. ... But if it were a good story with exertional syncope or something you'd have to treat it like it could be HOCM, etc. Tell me more." There is sinus rhythm with very large voltage and associated repolarization abnormalities. In V3-V6 there are classic and dramatic findings of BTWI including small or no S-waves, large R-waves, pronounced J-waves, ST-elevation, and steep dramatic T-wave inversions, all with a short QT interval. The patient was a 17 year old African American male with history of asthma who presented with chest tightness and shortness of breath for 6 hours. He improved almost completely after a duoneb (albuterol and ipratropium). However the clinicians were surprised by his unusual ECG findings. He had no prior ECG on file. He had no family history of cardiac issues or sudden death. Labs were normal, including troponin x2. He is able to play basketball routinely without any issues. In the ED he had a CT angio which was negative for aortic dissection. He was admitted for observation and cardiology consult. He had a normal CT coronary angiogram, as well as a normal cardiac echo. Serial troponins were negative. There is sinus rhythm with QS-waves in V1-V3. There is ST elevation in V1-V3 as well, with convex appearance and some terminal T-wave inversion. I advised the team that the patient has had a large anterior MI, but I cannot tell how long ago it occurred. It could be 6-12 hours after completion or reperfusion of anterior MI, or it could be days to years after the event. I advised them that I do not see any signs of reocclusion on this ECG, meaning that I do not think this ECG at this time represents acute LAD occlusion that would benefit from emergent reperfusion. So it agrees with our visual subjective interpretation that this is either subacute or old. I later found out that the patient had history of an LAD occlusion MI two months ago, with a stent placed. He was taken for emergent cath due to his history and the ECG findings including ST elevation (although ST elevation is a terrible way to distinguish ischemia from non-ischemia). His cath showed perfectly patent stents. Three serial troponins were undetectable. His serial ECGs did not change. There are many causes of ST elevation, terminal T-wave inversions, and both simultaneously. Experience with the cases on this blog can teach you how to differentiate them. Wellens syndrome (or reperfusion in general) is an important cause of terminal T-wave inversions. See these cases below for examples. However, Wellens' syndrome includes resolution of chest pain and preservation of R-waves, in addition to T-wave inversion. Thus, this second case would not be an example of Wellens' syndrome. 2. Wells S, Rowin EJ, Bhatt V, Maron MS, Maron BJ. Association Between Race and Clinical Profile of Patients Referred for Hypertrophic Cardiomyopathy. Circulation. 2018;137(18):1973-1975. It’s always great practice to be given tracings and “Put to the Test” as to whether you think acute changes are, or are not present. I came to the identical conclusion as did Drs. Smith & Meyers about the 2 ECGs in this case — albeit via a slightly different intuitive pathway. For clarity — I repeat the tracings in Figure-1. 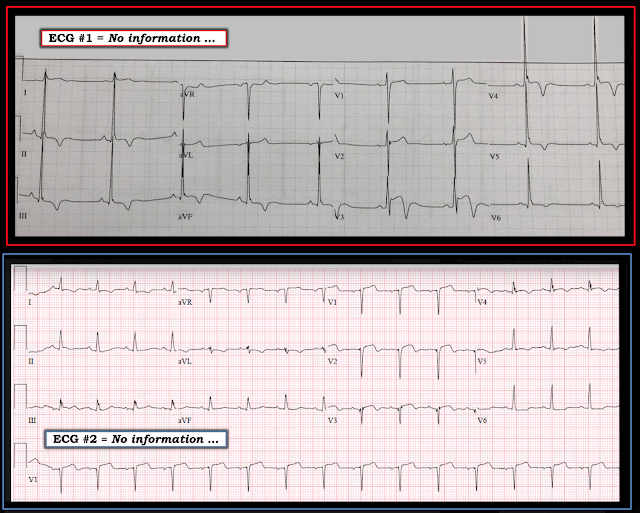 Figure-1: Two ECGs we are asked to assess, but without benefit of any history (See text). Knowing some History is KEY. 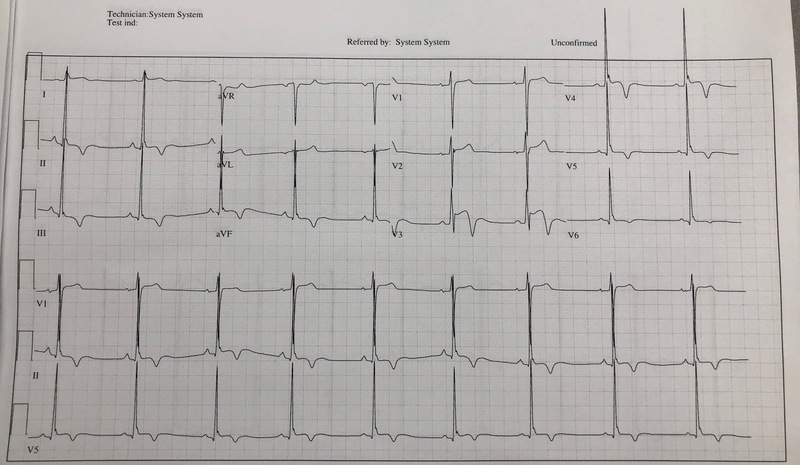 As per Dr. Meyers — If the history of this patient was worrisome, then the onus of “proof” still rests upon us to prove there are no acute ECG changes, rather than the other way around. REMEMBER — Patients with early repolarization on their baseline ECG may develop superimposed changes of acute STEMI, that can at times be difficult to discern because of pronounced baseline benign ST-T wave repolarization changes. That said, in addition to the benign-appearing findings described in detail by Drs. Meyers & Smith — I thought these findings in ECG #1 were probably not acute because: i) The Q waves in the inferolateral leads are very small (these look like normal septal q waves in a patient like this with an inferior frontal plane axis); ii) There is no reciprocal ST depression; iii) Except for lead V3 — the leads with the deepest T inversion manifest the tallest R waves; and, iv) Lead V3 is perfectly consistent with being a “transition lead” (ie, V3 looks precisely as I’d expect for a lead located in between the upright T wave and predominantly negative QRS seen in V2 — and — the huge R wave with deep T inversion in V4). The ECG appearance of patients with hypertrophic cardiomyopathy (HCM) is highly variable. Among potential ECG findings in such patients are LBBB, RBBB, IVCD, large Q waves in multiple leads (especially in lateral and/or inferior leads); prominent septal forces (ie, relatively tall R waves in anterior leads) — and/or marked increase in QRS amplitude in various leads with notable ST-T wave abnormalities (as are seen here in ECG #1). And sometimes, the ECG of patients with hypertrophic cardiomyopathy is surprisingly unremarkable. TAKE-HOME Point: The prominent QRS voltage and marked ST-T wave abnormalities in ECG #1 should clearly prompt consideration of possible HCM. An Echo is indicated if there is any concern. Knowing some History is KEY. As per Dr. Meyers — the correct clinical interpretation of ECG #2 is, “Anterior MI of uncertain age, possibly recent” — with need for clinical correlation. Reasons we KNOW there has been prior anterior MI in ECG #2 include the following — i) There is a fragmented initial Q wave deflection in lead V3 (and when you see this initial fragmented qrS deflection — it is highly suggestive of true prior infarction); ii) There is loss of r wave (a tiny r looks to be present in V1 — but it is wiped out by the q wave in V3); iii) The q wave in V4 shouldn’t be there (because this q in V4 is larger than the tiny q in V5 — and it looks like there is no q in V6); and, iv) ST coving and T inversion is most prominent in the anterior leads that manifest abnormal initial (q wave) deflections. Reasons for suspecting that even if ECG changes in ECG #2 were to be recent — they probably do not reflect acute coronary occlusion, include the following — i) It usually takes a little time to develop the fragmentation and the amount of lost anterior forces as is seen in leads V1, V2 and V3 of ECG #2; and, ii) The amount of ST elevation in the anterior leads is modest compared to significant loss of anterior forces and the extent of T wave inversion. NOTE: Exceptions always exist, and it is possible to develop the ECG picture seen in ECG #2 over a fairly short period of time … — BUT — “the look” of this tracing is such that I thought the changes in ECG #2 were probably not acute. The first ECG is a classic appearing ECG for young African Americans athletes. ECG interpretation in this population can be difficult as what is “normal” is not well defined and may look “scary.” TWI inversion in leads V1-V4 preceded by STE is quite common in this demographic, occurring in up to 13% of individuals, inferior TWI in ~6% (1). Because of this, International and ESC guidelines as well as the Seattle criteria consider anterior TWI (through V4) a normal finding in black athletes (2-4). The TWI in V5-6 and the inferior leads are considered a “grey zone” and most guidelines would recommend this patient be evaluated for underlying cardiomyopathy (5). However, these guidelines have still been shown to have poor specificity in black athletes with unacceptably high false positive rates of 40%- further illustrating how poorly we understand what a normal ECG is in this population (6). Granted, these were studies done on asymptomatic individuals- a different population from the one we see- presumably patients presenting to ER with some complaint that prompted an ECG (CP, SOB). However, understanding what is normal in the patients is important to understanding what is abnormal. I work in a military facility and I see ECGs that appear very similar in many young black individuals. In case 2, was there an old ECG to compare to? No, unfortuantely his history with a prior stent a few months ago was at another institution and we did not have access to any prior ECGs.